Gaius Petreius Ruso's penchant for falling into mysteries and his hapless relationships with former wives, family members and strong-willed British women continues to please. This third installment of Ruth Downie's series finds Ruso called back to his family's estates in Gaul by a terse letter ostensibly sent by his brother Lucius. The family has been pressured by its creditors ever since Ruso's father's death but things take a decided turn for the worse when the agent of one of the largest creditors is poisoned while meeting with Ruso. On top of that, Ruso's half-sister Marcia has fallen in love with a gladiator and Tilla has gotten mixed up with those crazy Christians. 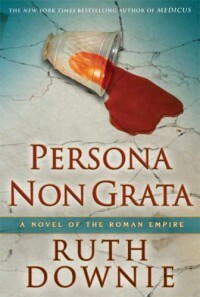 Persona Non Grata is comfort food but delicious comfort food and I'll continue to recommend the series.